Round Table: Palm for sale? Welcome to Round Table, which is in fact not a table at all. Round Table is a continuing series on PreCentral where we pose a question to the staff and they provide their thoughts and insights. The question could be something simple like “what’s your favorite webOS app?” or something a bit more complicated, like “what do you want from the next Palm device?” Or maybe we’ll just chat about bagels, you never know. For this go around the table we have to address the on-and-off chatter about various companies being interested in buying up Palm, Inc. Check it all out after the break (question comes from rlopin on Twitter): If Palm were for sale, what company would you want to buy them and why? Derek: I think that the best company to buy Palm would be one that has not yet broken into the smartphone business. Companies like Apple or RIM already have a preconceived notion of how smartphones should work and obviously webOS doesn’t fit that mold. So who? HP. “But HP already makes smartphones!” you say. Yes, they do. But those are Windows Mobile smartphones and they’ve been selling in smaller and smaller quantities every year. For a while it looked like HP might actually be getting out of the smartphone game all together before they debuted the underwhelming iPAQ 910 last summer. Outside of the handheld space HP has shown a knack for innovation and has handily eclipsed rival Dell as the top PC seller in the land. Adding Palm, and specifically webOS, to HP’s portfolio would give them an instant foothold in the smartphone market (as their purchase of former Palm parent company 3Com is doing for networking equipment) and would give Palm access to billions of dollars for R&D that could lead to much more impressive handsets. While I doubt that Palm is actively courting potential suitors, anybody that buys Palm is going to need deep pockets and a hands-off approach, and I believe that HP fits that profile to a tee. Dieter: Well obviously the first and most important thing to say is that Palm isn’t for sale and doesn’t want to be. The second thing to say that if Palm does go under (heavens forfend), what I’d really like to see is for Palm to just go ahead and open-source the entire webOS. This second option would mean that there wouldn’t be a single company that could take it and push it forward, but it would make an interesting story to see if any handset makers would use it. But if I had to pick one company to purchase Palm, it would have to be Nokia. Of all the handset makers out there, they are the most in need of a fundamental reset of their smartphone OS and I like to believe that they would have a decent shot at ‘getting’ the core philosophy of webOS. Keith: So Palm’s for sale... in theory. I’ve given this some thought, and I know I’ll get deadpanned by our readers, but it’s okay, I am the resident villain. HTC. Yep, you heard me. The once ODM turned OEM, for those not in the know, that is geek for an outsourcing company turned Branded product company (along with ODM work still, e.g. Treo 850). They’ve done a lot to improve upon existing mobile OS’s using their Sense/Manilla overlays. Most recently, everyone is praising Sense UI on Android and recently updated/renamed Manilla (now Sense 2.5). They come at a bit of a hit to system resources but that is generally overlooked for the functionality they bring to the underlying operating system. Now imagine what they could do to webOS if given the time and branding of their own. We know the hardware will be good (they don’t always have gems, but they quickly learn from their flops) and they could really capitalize on having a brand specific OS even if it means keeping the Palm name around as a subdivision of HTC. Adding webOS to their lineup of smartphone offerings would get the push it deserves and allow it to survive, whereas I think other companies could muddy up the intended vision of Palm. Robert: If any company were to purchase Palm outright, it would be have to be a private equity firm that would leave the current management team intact. Here’s why: The failure of Microsoft to maintain its market share in recent years, and that of Nokia make headway into the North American smartphone market has little to do with a lack of resources or engineering prowess, as the two companies I see as being the most likely to be potential suitors have plenty of both. Rather, I see their failure to make gains in this space as having everything to do with their management style and corporate culture. The move of either company to sink the required $2-3 billion (at minimum) into Palm (a company that has yet to become cash-flow positive) would fail to bolster their positions in the market: Palm’s current management team would certainly jump ship due to a clash of the very corporate cultures I mentioned earlier, Nokia would be supporting 4 operating systems, and Microsoft would have to divert resources away from the vaporware that is Windows Mobile 7. You’d see what was once a great smartphone platform, one full of potential, mismanaged into the ground. Going forward, I think Palm will remain off the market, will execute on its plan to become cash-flow positive by 2HFY2010, and will indeed become profitable by the end of FY2010 as they launch devices on more North American carriers, such as Verizon and AT&T. RIM’s BlackBerry Operating system was developed in enterprise, for enterprise and it’s strengths are as a communication/productivity tool. RIM has had tremendous success selling into the consumer market, but as consumer demands change what the priorities of a smartphone are, it makes sense for RIM to offer a consumer device. 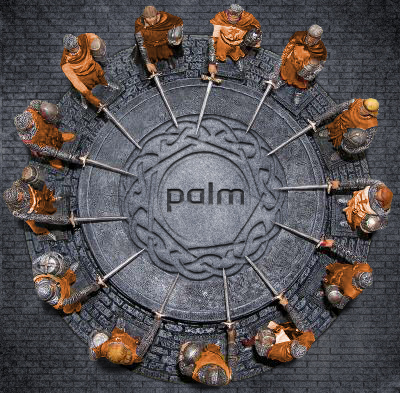 Palm Web OS could be RIM’s consumer smartphone platform, while the traditional BBOS could stay in enterprise. Get BlackBerry Messenger working on a Palm and we’re good to go! Both RIM and Palm are companies purely dedicated to Smartphones. Nobody else in the Smartphone game can really say that. This keeps the interests and operations purely aligned. RIM has trouble recruiting talent to their home base in Waterloo. Palm’s headquarters could become their US office. Jim Balsillie would probably have an easier time getting an NHL franchise in Sunnyvale than he does moving a team to Hamilton. Will it happen? Probably not. But the merging of CrackBerry.com and Precentral.net into one community would easily make us the greatest single website the world has ever seen since the invention of the interwebs! And that’s what we think. Now there are two more steps: (1) we want to know what you think (the comments below await your thoughts), and (2) we’d like to hear what questions you would pose to the gang - send your suggestions for Round Table questions to roundtable@precentral.net.